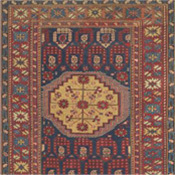 View a wide selection of antique Caucasian rugs now available for sale. Wheel of Life Appearing throughout time in numerous cultures, this ancient mandala shows the ever changing, yet cyclical nature of life. The tribal people believed life’s events were not haphazard, rather were gifts that, if embraced, could support one to grow. The mandala’s latchhooks encircling the wheel are associated with the dragon symbol. Often small stars were placed within the wheel, perhaps to demonstrate the potential fruit that comes from facing life’s events with balance and dignity. Boteh The precursor of the Indian paisley, the boteh is sometimes interpreted as a flame. 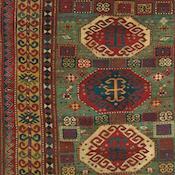 Among tribal rug weavers, it was often considered as analogous to a sprouting seed and symbolizes the “Seed of Life”. The boteh represents the ever present potential for growth and regeneration. It was very inspiring to the Caucasian tribespeoples that the magic of growth and abundance was possible even in the adverse conditions under which they lived. The boteh often encloses a mature plant within it, symbolizing that the whole always exists within the part. Gazelle The tribespeoples saw admirable attributes in the animals around them, which they strived to cultivate within themselves. The gazelle possessed the virtues of grace, fleetness and dignity that could be manifested in all situations and all aspects of life. Ram's Horn Sheep and rams were a vital source of warmth and comfort, as well as being central to the livelihood of the tribe. 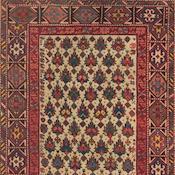 Their wool was the primary material used in weaving of antique Caucasian rugs, which they considered a sacred activity. Throughout history, the ram’s horn has been used to summon the group together as one. The ram’s horn symbolizes strength, power and fertility, suggesting that life itself is not temporary, but eternal. Rosette The Rose is the most magical and awe-inspiring of cultivated flowers. The rosette indicates that as a result of being cultivated by the creative energy of man, Nature becomes more refined and purified than it was in the primordial state. This is only possible through a harmonizing of man’s knowledge with the inner warmth of his heart, and a sensitivity to the laws that govern Heaven and Earth. "S" Motif The “S” antique carpet pattern is often thought to represent the dragon, the masculine or heavenly principle of life. It is also considered by some to stem from the Zoroastrian symbol for the Iifegiving force of the sun. The sun embodied the attribute of eternally shining and always nourishing all things without discrimination. 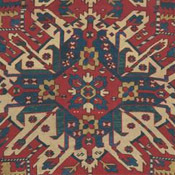 This may be why small “S” motifs are often scattered throughout the field of an antique tribal rug. The sun also demonstrates a central quality of illumination, that man may attain through striving for inner development. Star of Wisdom The eight-pointed star is an archetypal symbol that appears in cave drawings and likely stems from the dawn of mankind. This motif depicts man’s potential for inner wisdom and understanding; in fact King Solomon wore an eight-pointed star on his ring as a reminder of inner striving. 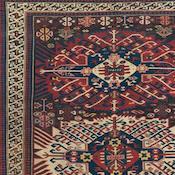 The antique tribal rug weavers lived an elemental lifestyle with minimal possessions.  They believed that wisdom was the true wealth that could be obtained through the striving one made amidst the many challenges of one’s daily activities. Dragon In the Eastern world, the dragon symbolized the heavenly influence that is ever present on the Earth. It is the masculine or cosmic element, the active principle that animates life and can be seen in all things. It is often shown in relationship with the phoenix, which is the feminine or earth element. This receptive principle embodies life in form and nurtures it to grow. In the ancient Chinese court, the emperor wore a dragon on his gown and the empress wore the phoenix. The dragon and phoenix may also be interpreted to depict the possibility of union between the mind and heart of man. 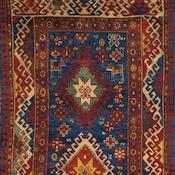 Running Water Both the nomadic shepherds and the sedentary agrarian antique rug weavers of the Caucasus considered everything that nurtured life to grow as sacred. Water was absolutely necessary to sustain and nourish life. 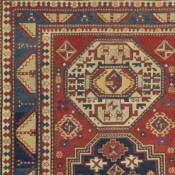 The running water border around a rug represents the life-giving quality of water to both the tribespeoples and their animals. It also symbolizes the possibility for inner purification. Bird Birds are symbolic of the miracle of flight and the potential for freedom from our human boundaries, indicating the possibility to see from a greater perspective. They also symbolize man’s innate striving for freedom of consciousness and the boundless joy of the heart. 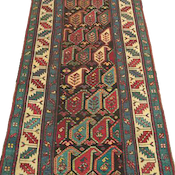 Fence of Security The innermost and outermost borders of antique Caucasian rugs often feature a reciprocal, crenellated fence motif. The motifs of the field signify that which is essential, the attributes that are the birthright of man and may inspire one for a more fulfilling life. These age-old symbols were considered sacred. The Fence of Security demonstrates that which is most valuable is also most vulnerable, so must be protected and respected. The double-edged fence also suggests that man’s essential life is untouched by the outer events of life. Peacock The peacock has a lineage associated with nobility and abundance. Its colorful plumes are regal, and suggest a level of beauty and splendor that is at once heavenly, and yet manifests on the earth. The tribespeoples believed that this same brilliance also exists in the depths of the heart.